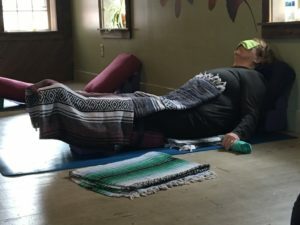 This blog entry begins with two videos, one on the sound of “OM” and the other a witty but poignant video by JP Sears on being your authentic “weird” self. Enjoy! What do you notice after you chant or hear “OM”? Is there any other word, sound that you feel something similar? How did you respond to this video? What can you do today to be your “weird” authentic self? Place two blocks under one bolster, one block higher than the other and place one block under the other bolster, making sure that they are facing each other. A blanket goes between the low end of the bolsters. 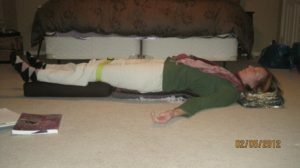 Use a neck roll or rolls for under the neck, hands, etc. 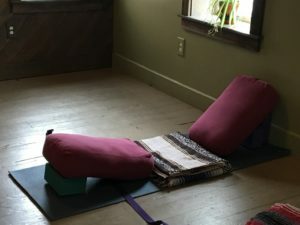 Come to sit on the blanket and extend legs up the one bolster and upper body rests on other bolster (like you are sitting between two mountains and your pelvis is in the valley!). 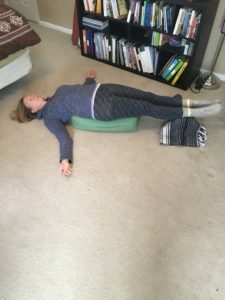 Loop a strap around your lower legs, making it snug enough that when the legs roll out, they are held in place (using no muscular effort to do so). Rest arms by your side and cover with any blankets you have available. Don’t forget your eye pillow.